Published on 7 September 2008. As we reach the final review of this series of ten, it seemed appropriate that I should return to something at least mildly connected with politics, given that I claim this to be a political blog. Hence, I’ve chosen the thoroughly enjoyable My Trade, by then BBC Political Editor Andrew Marr. 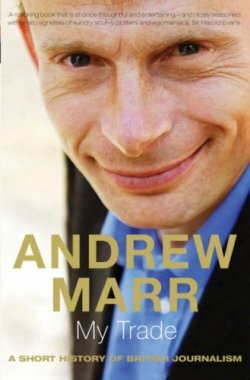 My Trade certainly delivers on its promise to provide ”A Short History of British Journalism”, but rather than delivering a dry journalistic history, Marr injects copious amounts of humour and panache. He provides many personal anecdotes – some longer and more developed than others, but all entertaining – and passes judgement on developments in the media world, rather than merely reporting their occurence. It’s certainly a very personal history for Marr, and that helps to involve the reader much more than the normal style of books written by journalists, which tend to read something like extended newspaper features. Anybody remotely interested in British journalism would be well advised to read a copy of this book – which certainly is no chore – as it provides much background on how newspapers are put together, and how this has changed over the years. It even provides some history on the rivalries between newspapers, looking at (as an example) how The Mirror’s sales declined at the hands of The Sun, and how Marr’s own Indy set out to be different from everyone else, but ended up being much the same. This is not intended to be – and nor is it – a detailed history of the development of the British media. Instead, it’s an enjoyable romp through the subject, stopping off at points of interest – particularly recent ones, and many of which you’d have thought he may have liked to avoid. He goes into some detail about Hutton and the problems of modern journalism, making convincing arguments for his point of view – which is, in part, critical of the BBC which pays him. It’s very clear from his writing that he’s experienced as a journalist, not just because he lists his many and varied jobs, but also because of the detailed insight he is able to deliver, and the apparent wisdom of some of his comments. Certainly, this is a very easy-going enjoyable read, from a political editor who comes across as an affable kind of chap, and a book which I must highly recommend. This review was originally posted here on sjhoward.co.uk in June 2005, and has been re-versioned for the ‘Summer Books’ series of reviews published on sjhoward.co.uk and Gazette Live. This 1,369th post was filed under: Summer Books, Andrew Marr, Books, Gazette Columns.